NB: Please note that Legal Online will be decommissioned on 31 December 2013. From January 2014, all updates will include links for Westlaw AU only (with the exception of the Journals available on Checkpoint, which will have an extra PDF). For further information, please click here. Definition of the boundary between the constitutional function of Parliament and that of the courts requires consideration of the function of the common law, or judge made law, in the context of parliamentary sovereignty and the function of the court in interpreting statutes and applying them. Legislative intention and statutory purpose are concepts which play an important role in marking that constitutional boundary. This article considers aspects of those functions and the need for reciprocal institutional restraint, courtesy and civil discourse between the institutions as an aspect of their constitutional relationship. The trial and appellate decisions in the Bell/Westpac proceedings have significant implications for fiduciary duties, directors’ duties and the scope of accessorial liability under Barnes v Addy principles in corporate insolvency contexts. This article examines two issues central to the proceedings in Bell, namely whether directors’ duties to act bona fide in the best interests of the company and for proper purposes are fiduciary in nature and the circumstances in which those duties will be breached in a near insolvency context. The extent to which Bell has altered conventional understandings of the “best interests” and “proper purposes” duties and the implications of any such alteration for corporate rescue strategies are explored. Nominate reports appeared in England between 1530 and 1865 through private enterprise and varied in both quality and accuracy. This article attempts to provide a helpful guide as to what reports are considered more reliable than others. The article will particularly focus on the reporters of the period from the accession of George III, 1760 to 1865. The interpretation of proportionate liability legislation has caused difficulty for courts in most Australian jurisdictions. Intermediate appellate decisions in New South Wales and Victoria had prevented some defendants from using the proportionate liability regime to limit liability, by adopting (essentially on policy grounds) a relatively narrow interpretation of the threshold definition, “concurrent wrongdoer”. The High Court (by a 3:2 majority) has now overturned those decisions, taking a broader approach in terms of both interpretation and policy. The decision makes it likely that a wider range of defendants will qualify as concurrent wrongdoers, and become eligible to limit their liability through apportionment. However, policy factors and value judgments will remain relevant to the apportionment process. Some cases may call for a very high (even 100%) apportionment of responsibility for the plaintiff’s loss or damage to a single defendant, even though that defendant has qualified as a concurrent wrongdoer. A national website for authorised law reports? What is it to be a barrister? What is admissible extrinsic evidence in interpreting a registered Torrens title instrument? 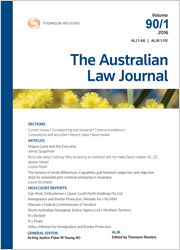 For the pdf version of the table of contents, click here: LOLA – ALJ Vol 87 Pt 12 Contents or here: WAU – ALJ Vol 87 Pt 12 Contents.